The OC Register provided a Letter to the Editor in yesterday’s Commentary section on the topic of term limits. It’s great to see a debate beginning on the subject. It’s also great that Barbara Venezia’s column has garnered so much attention. I have been amazed at the reaction. Most are not happy with what term limits have created and have expressed their gratitude that I’m thinking about supporting a modification. The letter reflects the other side of the debate. The comparison to the office of U.S. President is an interesting stretch. Being the leader of the free world is a bit headier than serving as a County Supervisor. There are good reasons for having term limits for our Commander in Chief. Let me assure you, I’m not worried about being termed-out. However, having served in this position, I believe that term limits place Orange County at a disadvantage relative to other counties, it is my job to let you know that. My issue is not term limits, but how many terms. I would argue that three terms, maximum, better serves the taxpayers. The letter is provided below. The trip was organized by Michael O’Connell, Executive Director of the Irvine Ranch Conservancy. The idea is to encourage Airship Ventures to fly out of the Great Park. Residents and visitors could see the wonderful natural landmarks from the air (see http://www.irlandmarks.org/) or take a tour over our wonderful 42 miles of coastline. Representatives of the Great Park and The Irvine Company were on board. The sponsorship contract with Farmers will end soon. If you know of a potential replacement sponsor, direct them to Joanne Fedeyko, Director of Sponsorships, who was our gracious host. TRIPLE BONUS: Speaking of the State of the County, I’ll be making a presentation on Thursday covering the cities in the Second District. The theme is based on the quote by Max De Pree, author of “Leadership is an Art,” “The first responsibility of a leader is to define reality.” The Orange County Breeze had an article on the event in Friday’s non-dead tree website article below. I read with interest the article, “Supervisor Moorlach pushing for changes to term limits” [Jan. 26]. Supervisor John Moorlach is worried about being termed-out in 2014. The U.S. president is termed-out in eight years. His job is much more complex and has a much longer learning curve than a county supervisor. We determined that if an elected official can’t get the job done they were sent there to do in eight years they probably never will. You were right about one thing, “I wonder if term limits fulfilled the law of unintended consequences.” Many of us naively thought that with term limits an elected official would go back to the “private sector” when they were termed-out. Unfortunately, they just keep looking around until they find another government position and keep feeding from the public trough. Orange County Supervisor John Moorlach, who represents the Second District, will be the featured speaker at the second annual State of the County Luncheon at Old Ranch Country Club February 9 at 11:30 a.m.
Moorlach, who now serves as Chairman of the Orange County Board of Supervisors, will focus his remarks on the Second District, which includes Costa Mesa, Cypress, Huntington Beach, La Palma, Los Alamitos, Newport Beach, Seal Beach and Stanton, as well as portions of Buena Park and Fountain Valley. The luncheon, which is open to the public, is co-presented by AT&T, CARE Ambulance Service, Consolidated Disposal, Southern California Edison and The Gas Company. The 11-11:45 a.m. V.I.P. reception precedes the luncheon, which is set for noon. Tickets for the luncheon are $30 with tables of eight at $240. Reservations as well as sponsorship opportunities are available through the Chamber office at 714-827-2430. The event also will feature a printed program for those businesses wishing to advertise. Advertising rates and additional information on the luncheon can be obtained through the Chamber office or online at www.cypresschamber.org. 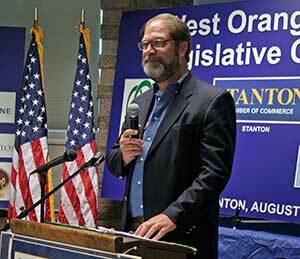 Orange County Supervisor John Moorlach speaking at last year’s West Orange County Legislative Mixer. Photo by C.E.H. Wiedel. Paul Clinton of the Daily Pilot covered the Measure V campaign in “Putting on the hits – Airport Working Group members create a limerick to argue against a measure that would make Orange County a general-law county.” I did not see anyone opposing Measure V, so I went to the Registrar of Voters to file an opposition argument. While at the counter, the clerk mentioned that someone else was doing the same thing at the same time. “We can only use one, can you decide it between yourselves?” After a phone conversation with Dave Ellis, I backed out. His was obviously much more entertaining. And seeing a little humor in a campaign is quite rare. The reporter did get confused between a General Law and Charter county. The county of Orange was a General Law county and Measure V was designed to make it a Charter county. For fun, I’ve included the entire article and I’m following it with the famous rebuttal argument to Measure V.
Having a bit of fun, two local airport activists submitted a rebuttal argument to a countywide measure that doubles as a cute limerick. Dave Ellis and Richard Taylor, both members of the Airport Working Group, submitted the rhyme as a rebuttal argument to Measure V, which would make Orange County a general-law county. In essence, Measure V would give voters more direct say in government and allow voters to elect a supervisor who leaves a seat vacant to run for higher office. The governor now appoints such replacements. Measure V is being promoted chiefly by Supervisor Todd Spitzer, who has announced he will run for a seat in the state Legislature. The rhyme, which Ellis said should be hummed along to the "The Beverly Hillbillies" tune, calls the initiative "a real career politician’s dream." Ellis, during a serious moment, said the limerick was a way to poke fun at an initiative that wouldn’t add anything to the county’s political process. "A bolt of lighting hit Rick Taylor and I, and we decided to have a little fun," Ellis said. "Generally, Rick and I don’t believe Measure V is necessary." Measure V is also being opposed by County Treasurer John Moorlach. Spitzer was unavailable for comment about the initiative or the limerick. However, in the argument in favor of the initiative, Spitzer argues that the governor should not be the one to appoint Orange County supervisors. In 1996, after Marian Bergeson left her seat for higher office, Gov. Pete Wilson appointed Tom Wilson to the seat. In the argument, which appeared in the voter pamphlet, Ellis and Taylor call the initiative "an end run around term limits — an idea that’s pretty hot" but also "a scam and that dog won’t trot." a local politician lookin’ for a better job. Todd went out lookin’ for a better payin’ bag. put your sights on the Capitol, it’s Sacramento or bust. yet the industrious man still knew which way the wind was blowin’. He wanted to leave his own legacy . . .
afterall, who could replace himself better than he? callin’ it Measurve V, a real career politicians dream . . .
and they raced to the ballot box and put it to a vote . . .
D-e-a-l-m-a-k-e-r, smoke filled room . . .
you see his constituents knew Measure V wasn’t so neat. they know it is a scam and that dog won’t trot . . .
it’s the democratic process these good ol’ boys are tryin’ to steal. This slick plan’s just a politician’s dream . . .
No on V . . . stop the politicians scheme. Orange County Treasurer-Tax Collector Chriss Street was sued for $7 million Friday and accused of wasting bankruptcy trust funds. The lawsuit alleges that Street, appointed to liquidate the assets of the bankrupt Fruehauf Trailer Corp., instead tried to enrich himself and build a business empire. The suit accuses him of breach of fiduciary duty and fraud. The lawsuit also alleges that Street had tax problems while running the trust. Street managed the trust from October 1998 until creditors forced him out in August 2005. Then-Treasurer John Moorlach hired him as his assistant in early 2006. Street then ran for Moorlach’s job in June when Moorlach ran for the Board of Supervisors. Street’s office referred calls to his attorney, Phil Greer, who declined comment until he could read the complaint. As for the lawsuit, Moorlach said, "Let’s get it out there and really decided. … We’ll get it all out there and decide what’s true and what’s not true." Orange County Supervisor John Moorlach, the former treasurer who backed Street to succeed him, said he wasn’t concerned about Harrow’s allegations last year, and the lawsuit is more of the same. Moorlach said he talked with Street during the campaign and was satisfied with his responses to the allegations. "I have been in close contact on all these matters with Mr. Street," Moorlach said. "I have not come to a point where I feel I should be disconcerted." Mike Anton of the LA Times provided a 50th anniversary update on Rossmoor in “Enclave’s splendid isolation up against the wall – On its golden anniversary, the bricked-off O.C. community of Rossmoor considers annexation, incorporation – or ‘super city.’” The topic of Rossmoor has certainly received plenty of attention in my UPDATES. However, if you are a new subscriber and want to get a good education on the subject, the entire article below should do the trick. When Ross Cortese, the visionary developer of Leisure World, built the postwar suburban enclave of Rossmoor he presaged the rise of the gated community by encircling much of his 3,500-home tract with a brick wall. In the half-century since, that "signature wall," as residents of the leafy, Ozzie-and-Harriet island of tranquility refer to it, has served as a not-so-subtle message to cities that have repeatedly tried to swallow Rossmoor through annexation: Keep out. "Rossmoor has a self-perception of being a very exclusive residential community that’s better than our neighbors," said Eric Christensen, president of the Rossmoor Homeowners Assn. "Our neighbors get pretty annoyed at that." Nestled between the San Diego and San Gabriel River freeways in northwestern Orange County, Rossmoor has a history of geographic split personality. When its homes were springing up in the late 1950s, the place was promoted as a subdivision of Los Alamitos — and later as Long Beach’s spiffy new suburb. Today, Rossmoor has a Los Alamitos mailing address, while the Shops at Rossmoor and the Rossmoor/Los Alamitos branch library are in Seal Beach. Now, with the county pushing to shed responsibility for providing municipal services to unincorporated areas, Rossmoor finds itself at a crossroads. Does it want to become part of Los Alamitos? Try to join Seal Beach? Should it incorporate? Expand the powers of its current community services district? Or become part of a "super city" blending all three communities into a municipal smoothie, as county Supervisor John Moorlach has proposed? Each option has its pros and cons when it comes to bottom-line issues of taxes and services, in particular Rossmoor residents’ concerns over comparatively slow Sheriff’s Department response times, cuts in county code enforcement and a sluggish building permit process. But as Rossmoor turns 50 amid a renovation and construction boom that’s transforming it into a neighborhood of mini-mansions, the community’s self-image becomes equally important. Stay away from SB, they ruin everything! Look at the map. We are next to and naturally associated with Los Al. I love Rossmoor as it is now. Like any place that considers itself special — the wall, no stop lights or through traffic, no apartments, lots of mature trees — Rossmoor has always been protective of its identity. A couple of annexation attempts by Los Alamitos in the 1960s caused residents to close ranks. When Seal Beach later annexed the Rossmoor Business Center — and its tax base — the incursion fostered bitter feelings. "We hate Seal Beach. They stole our shopping center," said Dee Nilsen, who has lived in Rossmoor for 31 of her 58 years. More recently, the city allowed a retail strip to be built across from one of Rossmoor’s entrances. Nilsen and others have boycotted the strip because of the increase in traffic. Nilsen also doesn’t care for the strip malls, apartment buildings and urban feel that define parts of Los Alamitos — a common refrain along the homogeneous streets of Rossmoor. "I hate Los Alamitos," said Nilsen, who prefers that Rossmoor govern itself. "It’s a hodgepodge of nothing." "I think most people don’t fully understand all the options," said Joe Woodman, 62, a 38-year resident and retired physical education teacher for the Los Alamitos Unified School District. Woodman said he would prefer autonomy to annexation, but thinks Rossmoor has more in common with Los Alamitos than Seal Beach. "That’s where our kids go to school, and the school district is what defines this community," he said. Excellent schools have been one of Rossmoor’s biggest draws, a reason why a teardown can cost $800,000 or more. But to Shirley Bailey, Rossmoor’s history of self-reliance is what has most shaped the community and is the best argument for self-government. When two unused school sites became available, residents voted to tax themselves to turn them into parks. After an earthquake damaged Rossmoor’s wall, residents taxed themselves to repair and retrofit the entire thing. "I hate to see a change occur. I’m such a believer in the homeowners association," said Bailey, 67, who prefers to see an expanded community service district. "But if it were to occur, I’d rather become part of Seal Beach. The name ‘beach’ brings … prestige with it." Seal Beach has said it’s not interested in considering annexation; Los Alamitos is neutral on the subject. The Rossmoor Planning Committee, charged with sifting through the options, decided recently to circulate a petition seeking cityhood, said Christensen, the homeowners association’s president. Any proposal would require a review, an election and approval by the county’s Local Agency Formation Commission. "Life in Rossmoor has been very good," Christensen said. "But if we don’t do something now, somebody’s going to do something for us at some point." Alicia Robinson of the Daily Pilot provided an airport update in “Newport looks to secure JWA growth limits.” At that time, it was too early to begin the negotiation process. Now’s the time and I’m happy to report that those efforts have begun with the parties mentioned in the piece below, which is provided in full. With the legal agreement that caps flights at John Wayne Airport set to expire in eight years, Newport Beach officials are moving to consolidate support from residents to prevent any further expansion of the airport. The City Council later this month will consider officially declaring support for two citizens’ groups — Airfair and the Airport Working Group — and opening a dialogue with the groups. Flights and passenger levels are limited by a settlement agreement among the city, Orange County, the Federal Aviation Administration, and two community groups, the Airport Working Group and Stop Polluting Our Newport. The agreement places a cap of 10.3 million passengers a year on the airport through 2011, when the cap rises to 10.8 million annual passengers. The agreement is set to expire at the end of 2015. "That’s only eight years away and it isn’t too soon to be looking at what it would take to get an extension of that agreement," Newport Beach City Manager Homer Bludau said. The Airport Working Group has been around since 1982, but Airfair is newer. Since it was formed in 2002, the group has sought backing from councils in cities affected by airport operations. The move by Newport Beach’s council may be largely symbolic — Airport Working Group President Tom Naughton said he’s been working with the city since the group was formed. But to Bludau, presenting a united front against expansion of John Wayne Airport can only grow more important as Los Angeles officials look to regional airports to take pressure off of Los Angeles International Airport. At a regional level, the key will be encouraging passengers to use airports in Palmdale and Ontario — and figuring out ways to get them there, said Orange County Supervisor John Moorlach. He represents the county on the Southern California Regional Airport Authority, a position that’s brought him more than 250 letters from mostly Newport Beach residents asking for permanent caps on flights at John Wayne Airport. The airport’s physical expansion is limited by an agreement between Newport Beach and the county that gives the city veto power if the county tries to buy land for a second commercial runway. However, airport officials are poised to begin a major facility expansion that is allowed by the settlement agreement. The Newport Beach City Council will consider support for Airfair and the Airport Working Group on Feb. 13.